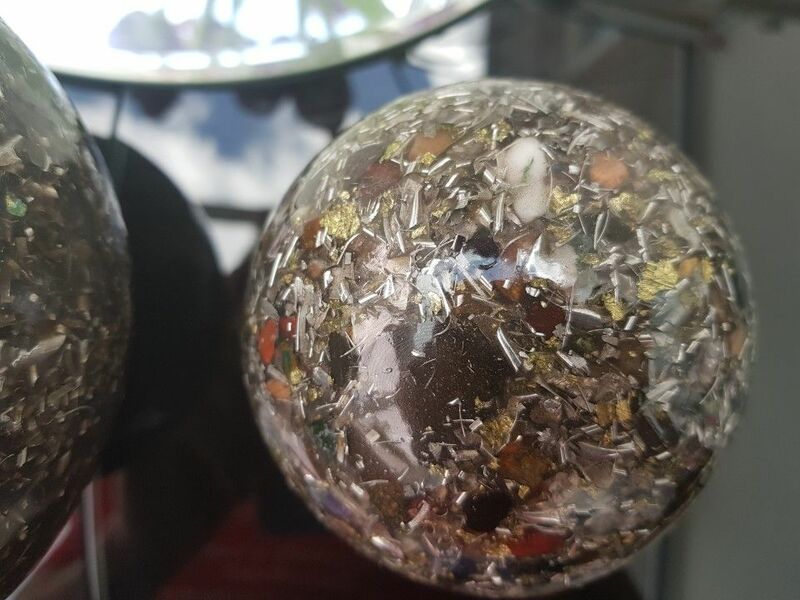 This Orgone Sphere is probably the most beautiful device I have created and comes with its own stand and a slight flat base so it can stand on its own or upon the stand to give it a contemporary look, it would look amazing in anyone’s house as a centrepiece and conversation starter. When you look into the sphere it’s as though you are gazing into the universe as it looks truly stunning. It is a very special sphere as it radiates Orgone energy in ALL directions, sending out a steady vibrational pulse for a radius of 10-15 metres. The energy from this sphere is absolutely amazing. I have been very greedy by keeping these for myself for a few months whilst testing as I didn’t want to let go! I only have five available as I broke the mould! I was devastated! I have 2 sizes 90mm and 120mm they are quite heavy for the amount of Arkansas quartz I have put inside them as they point out in each point/corner of a dodecahedron. 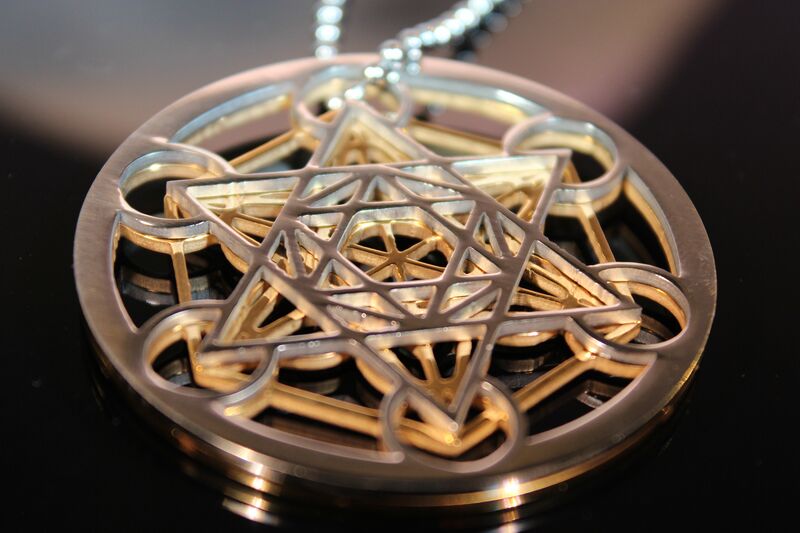 It also has real 23k gold flakes, iron, copper, brass, silver and steel wool. The centre contains a magnetite Crystal, a chunk each of tektite, Black Tourmaline, Elite Shungite and a Rhodizite Crystal. It also has Black Amber, which is "buried" at the bottom of the second half of the sphere. In ancient times Amber was believed by occultists to protect oneself against malignant spirits. 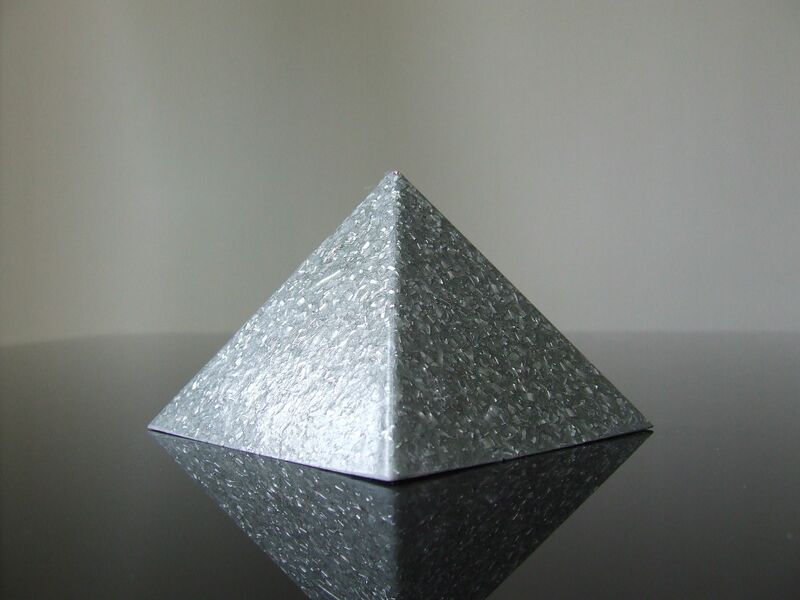 You can use this for meditation, cosmic ordering or placing near a Wi-Fi router, I wouldn’t advise to put near your bed unless you are use to Orgone energy as you may not sleep that night! You can also keep it nearby during chakra-opening practices like yoga, or deep stretching. Take the Sphere to your yoga class, or to stretch out on a tranquil stretch of grass or beach. The Orgone Sphere may be placed in any location of a room to enhance it ascetically, energetically, and spiritually in various forms. The greatest location to place any Orgonite piece is always near an active electronic device such as a TV, a Computer, or a Wi-Fi Adapter. This feels really good to hold and roll around in both your hands ... makes a great piece for using with massage. This sphere is a powerful spiritual tool that can be used to enhance your life physically, mentally, emotionally and spiritually. 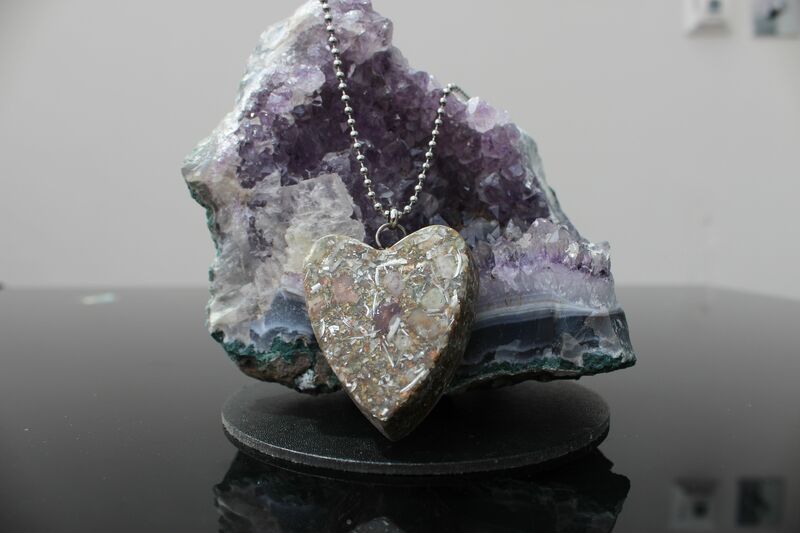 Based on the principal of Orgone energy, also known as Chi, Ki, Prana and Life Force, it is the energy present within all objects. This generator will reduce the effects of EMF (electromagnetic field) radiation from cell phones, computers, TV's and many other electrical devices.